There are plenty of small towns around the world that could be referred to as one big museum. Hoi An is one such town, but they have taken the concept one step further. 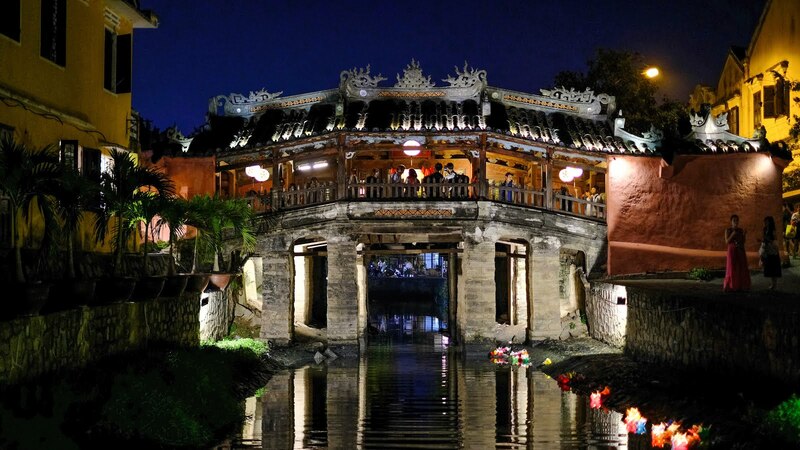 In theory, you need an entrance ticket for Hoi An's historic old town. In practice, you probably don't. At no point were we asked to show our ticket when walking around. I've read that people on walking/food tours are sometimes stopped by ticket enforcement agents, but I suspect even this is probably rare. Mrs P and I did a food tour without incident. Not that we had anything to fear - we had bought a ticket each. They aren't expensive at £4/$5 ish per person. They also allow you entry into five places of entry, which makes the ticket a bargain if you visit a few temples/museums/houses. You only need to buy the one ticket for your stay, unless you intend to visit more that five sites. Probably the most popular of the sites that you can use the ticket for is the 16th century Japanese Bridge, as shown in the photo above. We also went to see a rather bizarre folklore show which presented the audience with traditional dance to western classical music and finished off with a rendition of Auld Lang Syne.